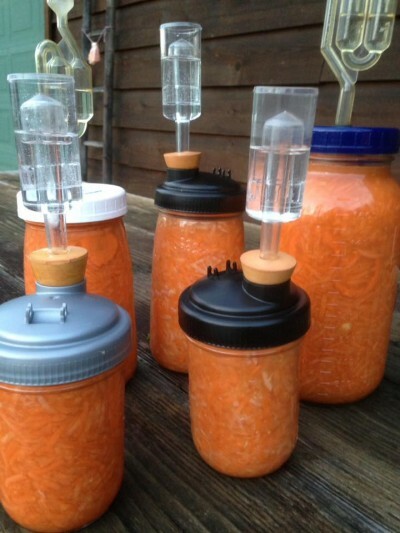 Fermented Ginger Carrots - Raw Juicy Living - Recipes and Workshops for Parksville, B.C. Carrots can be grated with a food processor. The fresher and sweeter the carrots are, the better your fermented ginger carrots will be! Combine the carrots and ginger together in a large bowl. Pack the carrots in a 1 litre mason jar, packing down with a tamper. Cover the carrots with the water (you may not need to use all of it) and bang the jar on the counter to release any air bubbles that remain. Cap with a fermentation lock and set in a dark place for approximately one week. You can begin tasting them after 4 days.....a warm environment will result in a faster fermentation time.